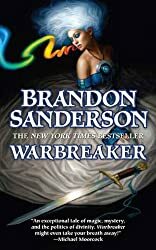 Brandon Sanderson, author of the popular Mistborn trilogy and the writer chosen to complete Robert Jordan’s epic Wheel of Time series, released one of his novels, Warbreaker, as he wrote it so that student writers could learn about the evolution of a novel from beginning to end. Brandon also believed that by giving away one of his books online for free, it would expand his audience and give more people the opportunity to find out that he’s a good writer, so that they will then have an interest in purchasing his other novels. Download Note: The link and image below directs to Brandon Sanderson’s official website where there are various versions of Warbreaker to download. The latest free versions is 6.1, and it’s available in PDF and PRC formats. If you want EPUB, download the PRC version and then convert it with Calibre (check the previous post for directions on how to use Calibre). Version 6.1 of Warbreaker is the last step before copyediting. It contains some typos and formatting differences from the final published version. The Final version sells from most ebook sites like Amazon, Kobo, and B&N for around $5.99. “Warbreaker” is the story of two sisters, who happen to be princesses, the God King one of them has to marry, the lesser god who doesn’t like his job, and the immortal who’s still trying to undo the mistakes he made hundreds of years ago. Their world is one in which those who die in glory return as gods to live confined to a pantheon in Hallandren’s capital city and where a power known as BioChromatic magic is based on an essence known as “breath” that can only be collected one unit at a time from individual people. By using “breath” and drawing upon the color in everyday objects, all manner of miracles and mischief can be accomplished. It will take considerable quantities of each to resolve all the challenges facing Vivenna and Siri, princesses of Idris; Susebron the God King; Lightsong, reluctant god of bravery, and mysterious Vasher, the Warbreaker.